The artist, Hans Hofmann, once said, “Through a painting, we can see the whole world.” When we own a painting or are responsible for its care, we should bear this in mind. Whether it’s a piece of great art, a family treasure or the result of artistic endeavor, don’t let your paintings get damaged. Read on to learn how to ship a painting, safely. The risk of damage to a painting starts from the moment it is taken down from the wall. In fact, the wall is the safest place for it. Don’t remove it until you have to. You may be anxious that damage will occur while the painting is in transit. Be aware that damage can occur at any stage of the shipping process including while it is being packed ready for transit. Prepare a clean clutter free area to work in. A large table or floor area with protective cardboard, cloth or bubble wrap is ideal. Keep sharp tools safely away from the work surface. Take pictures before, during and after packing. This will help if you do have some damage and need to make an insurance claim. Take pictures of the painting from all angles. Include close up shots of details. Include any pre-existing damage. Continue to take pictures at each stage of packing to show the use of packing materials. Take pictures after packing of the completed job. Take pictures of labels on the outside of the package. Use glassine paper to wrap the entire canvas. This will protect it from dust and moisture. Using acid-free archive quality paper and tape is essential as other wrapping materials contain chemicals that can damage the painting. It may be possible to roll a painting but first protect it with a couple of sheets of glassine paper. Put the painting on top of the paper leaving a 2-inch overlap of paper. Paper-based artwork should be face up and canvas or linen-based artwork face down. Roll gently. Secure with artist tape. Wrap un-rolled paintings in three layers of bubble wrap. Pay special attention to the corners. Use cardboard to make corner protectors and fasten them to the body of the parcel. Protect the glass in frames painting with tape. Using four strips of artist tape create a star from edge to edge. Don’t put tape on the frame. Wrap the whole painting in three layers of bubble wrap. Use cardboard to make corner protectors and fasten them to the body of the parcel. Always have the smooth side of the bubble wrap nearest the painting. Don’t allow the bubble wrap to come into contact with the painting or frame. Always have a layer of glassine paper between the painted surface and the plastic. Two inches of bubble wrap will be sufficient protection for most situations but three is better. Tape seams to reduce the risk of water ingress. Wrap rolled artwork in bubble wrap too. Your parcel may be protected against knocks but the strength of the parcel is still only based on the strength of the artwork and frame. It needs protecting from bending and twisting. Fastening the paining between two foam boards will achieve this. Tape the boards together but don’t apply excessive force. Your major worry is how to avoid damage during shipping. Placing the wrapped artwork in a shipping box is not enough. Damage can occur inside the box if the package is able to move. The key is to make sure there are no spaces inside the box. Packing peanuts are often used in shipping boxes but they are prone to move or settle creating voids. This allows the artwork to move within the box. Use additional bubble wrap to fill any spaces. Pay particular attention to the top and the bottom of the box. If necessary, wrap the whole parcel again to fill the space. Tape up the seams of the shipping box with 2-inch heavy-duty packing tape. Don’t use other types of tape. They are not suitable for packing and shipping. Strengthen the edges with further strips of tape. Pay particular attention to the opening flaps. When it comes to shipping your painting, you have several options. You could use a parcel carrier, freight shipping or furniture movers. Parcel carriers may be able to handle shipping your painting. Check their size or weight restrictions. Freight may be the only option for large paintings. Make sure that the freight shipper is able to provide suitable care for artwork. Check if the shipping box has to be palletized. Furniture movers also move paintings and may offer a packing service too. Be aware that unless they are specialized in moving artwork they may have an overly casual approach. Discuss their service before trusting a valuable piece of art to them. Despite all your care and attention, it is still possible that an accident damages the artwork. In that case, you will be glad you had insurance. It’s possible that you fall back on your insurance only to find that the insurance cover is inadequate. Check what insurance your carrier provides. Is it sufficient to meet your needs? It can be difficult to understand what is covered but you must persist if you hope to resort to the insurance if the worst happens. Check the packing requirements of your insurance and keep to them. Understand any valuation requirements and follow them. Understand what the requirements are for making a claim should it be necessary. Paintings are shipped safely every day. It may seem that these guidelines involve excessive work and time but that is how to ship a painting successfully. These steps are necessary to protect the painting from what is a potentially damaging process and get it back to safety, hanging on a wall. Ready to move your artwork? It’s time to talk to professionals about shipping. If you’re like most e-commerce stores, you rely on online shoppers and fast shipping to make your money. A lot of factors can make your business more complicated. Flat rate boxes don’t have to be one of them. In fact, they can be a huge asset to your bottom line–if you know how to use them properly. Keep reading for a step-by-step guide of everything you need to consider when shipping flat rate boxes. You’ll be a pro in no time! First things first: do your homework. Any time you look into a shipping plan, you have to spend an equal amount of time looking into its competitors and doing a cost-benefit analysis of each one. Maybe one costs less but is ultimately less cost-effective than its pricier counterpart. You’ll never know until you research. Fortunately, all the major shipping vendors (US Postal Service, FedEx, UPS, and DSL) explain their rates and available services on their websites. How Does Flat Rate Shipping Work? Once you’ve done your homework on the available services out there, we can spend some time talking about how flat rate shipping works. In this case, we’re talking about the USPS Priority Mail Flat Rate service, which will ship your package anywhere in the U.S. in one to three business days for a flat fee. Most other services will have varied fees based on the weight and destination of a package. First, you’ll need a flat rate box (hint: you need the branded boxes in order to get the flat rate). Ideally, you want a box that’s a snug fit for your products, since larger boxes are more expensive. Keep in mind, however, that you can’t ship anything through this service that weighs more than 70 pounds. When you put flat rate boxes in the context of other services, it seems like an easy way to save money on shipping. Here’s the thing: if you ship everything flat rate, it’s actually going to cost more. Regional rate boxes work a lot like flat rate boxes, except that there are three weight tiers (flat rate accepts any weight under 70 pounds), and the shipping rate varies based on the distance the package has to travel. The shipping rate is broken down by shipping zones. Here’s the kicker: if your box is headed to Zone 1-4, it’s actually cheaper to ship with a regional rate box than a flat rate box. Then there’s priority mail. It might sound counterintuitive, but when your packages are lighter, priority mail can be cheaper than flat rate boxes. Let’s say you’re shipping a 3-pound box from Houston to Miami. With priority mail, this will cost you around $8.98. If it can fit in a small flat rate box, it will cost $6.85, but if it can’t, it will cost $12.45 in a medium flat rate box. So if you’re considering using flat rate boxes, make sure to use this calculator to figure out how much the package will cost to ship. This leads to our next point: know your way around box sizing and pricing. This will make it infinitely easier to figure out where you should use flat rate shipping or not. Keep in mind that items must be less than 70 pounds and you should find a box that is a snug fit for your product. There are also restrictions on shipping certain materials, including restricted, prohibited, or hazardous materials like ammunition, explosives, gasoline, alcohol, or tobacco. Make sure to read the full list of restricted items before putting them in a box. If it fits, it ships, right? Sort of. It might ship, but it might cost you more than you thought. This is because of dimensional weight changes. These days, dimensional weight is calculated in addition to the actual weight–and you’ll pay the higher of the two. Make sure to measure and weigh your packages first. You don’t want to pay more because you didn’t account for dimensional weight. Finally, it’s time to get your label. First, you need to double check the box and shipping method you’re using. The box won’t ship if the label doesn’t match the packaging you’re using. Fortunately, this is pretty easy, since many services now allow you to print the label online. Once you’ve got your label, print it and affix it to the box. From there, you can drop it off at the post office, drop it off in your mailbox, or arrange for a courier to pick it up. Are you ready to start shipping flat rate boxes? If you feel comfortable and ready to send your packages into the world, awesome! We’re here to help. And if you’re still feeling unsure of the whole process, no worries. We can help you with that too. Click here to get started with a courier shipping form, or get a quick quote to see how much a package will cost you. It’s fast, easy, and leaves you plenty of time to focus on doing what you do best: running your business. If A Person Gets A Home Delivery By Mistake Can They Keep It? Yes. And, No. Getting a miss-delivered package isn’t common, but it happens every now and then. This poses a difficult question: If you receive goods that you didn’t order, can you keep them? Many households across the country receive orders by home delivery that they didn’t order–or the wrong items. What do you do? Can you keep the items? Let’s get into what you should do if unsolicited items and goods have been delivered to you by mistake. There are some specific rules that you should be following–so that you don’t end up in hot water later down the line. What If You Receive Unsolicited Goods? When a company sends you an item that didn’t order, it’s called an “unsolicited good.” In these cases, you’re well within your rights to keep them. If you have goods delivered to you that you didn’t ask for, you have no obligation to send them back or to pay for them. If you receive an invoice payment for unsolicited goods, you can ignore it. Demanding that you pay for goods you didn’t request is a criminal offense. What If You Receive a Mistaken Delivery? When it comes to a mistaken delivery, you’ll need to contact whoever sent them and ask them to collect the goods. The difference between a mistaken delivery and unsolicited goods is simple. You can identify a mistaken delivery if the address and name on the package are different than yours. In many cases, you might find some similarities, but this package should be labeled for somebody else. Call customer service for the company in charge of delivering the item and tell them what happened. The tracking number on the package should help them locate where the items need to be sent next. This shouldn’t cost you anything–and you shouldn’t be inconvenienced in any way. The company should send someone to pick up the product within a reasonable timeframe. Companies will be alerted by the sender or their tracking system that the shipment wasn’t delivered to the right address. Even if you don’t alert them of the wrong delivery, they still might call your house or show up at your door asking where the package is. Also, don’t try to reach out to the person who should have received the package. Respect their privacy by going through the shipping company rather than reaching out to the individual directly. If the intended recipient shows up at your door demanding the package, don’t give it to them. It’s not ethical for the shipping company to give them your address–and it might be a scammer. Only return the package to a confirmed representative of the shipping company. If you reach out to the company and don’t get any response, then you can feel free to keep it. Sometimes, it won’t be worth the company’s money and trouble to retrieve it–in which case you’re free to keep the package. Why Did the Package Go to the Wrong Address? There are a lot of reasons why the wrong package might end up at your house or apartment. Certain house or apartment numbers might be challenging for the courier to understand. The numbers might get switched around during the delivery process or the written address could be hard to read. Somebody could have made a mistake when originally ordering–or they could have put an old address instead of the new one. In many cases, the original recipient won’t realize what’s wrong until they get package delivery confirmation–and the package still hasn’t come to their doorstep. In this case, they might reach out to the shipping company, who may then reach out to you. 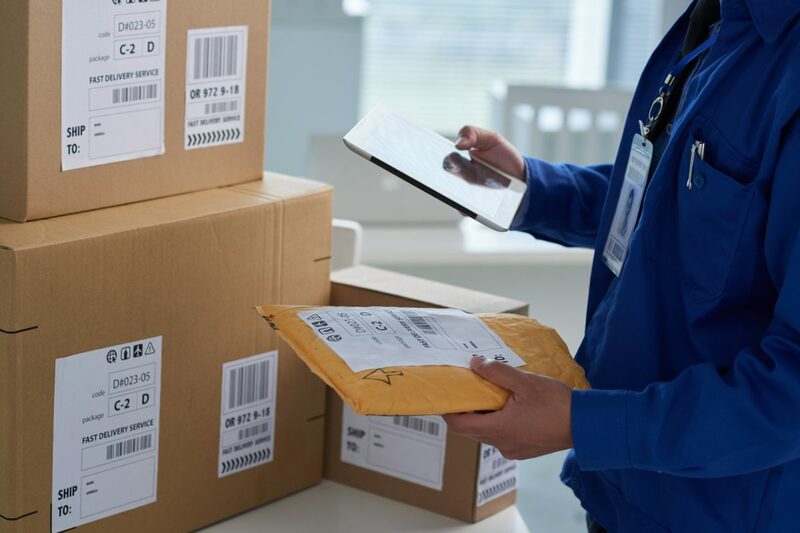 It usually comes down to an old-fashioned mistake–but if you start persistently receiving the wrong packages, it’s crucial that you get in touch with the shipping company to figure out what’s been going wrong. Can You Sell Items That Are Delivered To You By Mistake? Yes, you can sell items that were mis-delivered to you, but you have to follow a set procedure. You still have to follow the rules that were set above. Be sure to reach out to the company to inform them of the mis-delivery. Give them the chance to come and pick it up. Contact the company twice–and do it in writing in order to provide clear evidence that you gave them the chance to pick it up. Even after you’ve sold the items, hang on to the cash for a little while longer. The specific laws depend on your state, but the original owner can still claim the money from you for up to six years. If you’ve had the package for a while and nobody’s come to pick it up, it doesn’t hurt to make the best of your situation. Just try your best to send it back–and be prepared to return the package (or the money). If you receive goods from a home delivery that you didn’t order, can you still keep them? The rules aren’t always clear, but a mistaken delivery is never your fault. As long as you follow the regulations, respect the intended recipient’s wishes, and do what you can to return the package–there’s not much more that you can do. If you’ve jumped through all the hoops and still can’t get the package back to the owner, it’s all yours! Looking for a reliable, helpful courier company to take care of all your shipping needs? Get an instant courier quote here to learn more. Does your business need same day delivery services on a regular basis? Are you on the hunt for courier delivery that will meet all of your needs? Every year, the Amazon websites ships more than 5 billion items. But how can you get the same quality of service that larger businesses do? If you’re in the market for professional, local couriers service, this article is for you. We’ll cover some features that you should look for in a courier service and we’ll help you get your packages zipping around the country with same day delivery service. Courier delivery has developed as an alternative to larger shipping companies. They often offer quicker and more secure delivery options, especially for larger packages weighing over 50 lbs. You can courier anything from medication to retail clothing to food. If your company regularly needs to ship sensitive information with same-day delivery, a reputable courier service could be a great solution. Contracts, other business-related documents, and electronic devices are all great candidates for same day shipping services. There are delivery trucks, flights, and even in-town walking couriers who can deliver your packages quickly and safely. Throughout the world, courier services are making inroads against larger shipping companies. Even though the delivery market is still dominated by a few big players right now, couriers are becoming more trusted for time-sensitive documents like contracts, deeds, and wills. Their market share is growing by 4% yearly and expected to continue. The best courier service is one that meets all of your business’s needs. Before you commit to a courier service, ask some of your colleagues which companies they have used. You’re looking for courier and delivery services that are fairly priced and that have a track record of delivering on time. One of the best things about courier service is that you’re not dealing with shipping giants. You’re connecting with a smaller company that has more time to focus on its clients’ needs. You should look for security backup measures like requiring a signature upon delivery and thorough package tracking options. Once you find a courier delivery company, ask them about their services. Can they ship non-standard sized packages? How about packages that are over a certain weight limit? Is there a flat fee for all shipping, or does it vary by size and distance? How do they handle international packages? If you can, have a look at their trucks in your local area. Do their delivery people look professional? The courier service you choose is going to represent your business, so you should make sure they’ve got a professional vibe going and are fulfilling deliveries in the proper time frame. When you’re ready to ship, talk to your courier delivery company about your shipping options. Are you sending material that is temperature-sensitive? Do you need same-day shipping? Is this a one-time delivery or do you have to make it every week or every month? 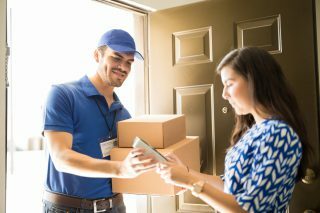 Reputable courier services can often offer same-day international shipping due to their extensive network connections. If you’re going for the same day shipping option, try to have your package ready as early in the morning as possible. Contact your courier company the day before to schedule pickup, and check your tracking information during transport. We offer international freight shipping. To get a quote, check out our website and input the dimensions of your package. Make sure that you get a quote as far in advance as possible, and always alert your recipient that they have a time-sensitive package on the way. Courier services can be incredibly useful to import companies. if you need port drayage services, trailer receiving and sorting, or transloading, we’ve got you covered. We also offer online visibility in real time for complex import orders. You might be surprised to find out just how many industries courier companies serve. There’s the legal field, of course, with same-day delivery of confidential court documents and personal legal paperwork. Accounting firms also make use of couriers – and their reliable time and date stamps. Event planners use courier services to deliver last-minute items or fulfill unexpected requests. Courier services can handle retail deliveries, freight that is “stuck” at a warehouse, or even lifesaving blood donations. There is a wide range of industries that use courier services. If you’re using larger shipping companies, you might be spending too much money. If your package is a non-standard size, contains biological samples or pharmaceuticals, or contains food, make sure that your courier service is aware of that. There are rules that govern international shipping and you don’t want your package to get stuck at the border. How Can I Get Started With Local Couriers Service? The first step in working with a courier service is to prepare your package. If it’s going to be delivered in the same town, do you need it there in four hours or two? We also have super express vehicles that can complete deliveries in 90 minutes or less. How big is your package? Can it be carried to its destination by a walking courier, or do you need a van? Can your package be wrapped up or do you need it to be shipped without a covering? Again, it’s always a good idea to prepare your package with the address of its destination before the local courier service arrives. You’ll also need an email address to receive verification of shipment and delivery. This is important for same-day delivery packages as well as shipments overseas. The delivery person will get a signature, but they’ll also communicate with you via email after they drop off the package. Send us a quick email or give us a call and we’ll get you started on your quote. Local couriers service can be affordable and convenient, delivering around the country within hours. No matter where you need your package to go, we’ll help you get it there with time to spare. We’re looking forward to working with you! Have you ever tried to ship jewelry before? Maybe you’re moving across the country and are looking to ship some of your belongings to your new house. Or maybe you run an online business and need a reliable way to get your products to your customers. Whatever the reason, shipping jewelry can be slightly different from shipping other things. The high cost associated with many types of jewelry means it’s at a higher risk of being stolen, and being damaged during shipping can be costly. What can you do to ensure your jewelry makes it safely from point A to point B? The good news is that there are several tips you can follow when shipping jewelry. Read on to find out more! The first thing you’ll want to do when mailing jewelry is to make sure it’s packed correctly. Many people don’t think about what a package really goes through during its journey. However, your package may be dropped or have heavier packages fall on top of it. While typical jewelry is sturdy enough to handle a lot, you’ll want to ensure it arrives in one piece by packing it tightly. If you have a jewelry box, start by placing your jewelry in this. The durable cover will act as a great barrier from potential damage. Use bubble wrap and the right sized package. Keep in mind that larger packages are less likely to be lost. However, if the package is too big, then your jewelry will constantly shift around. However, it’s not enough to just pack your jewelry tightly. The safest way to ship valuables is to use good quality packaging materials. For example, opting for bubble wrap-lined packaging over a thin cardboard package will add an extra layer to protect your jewelry. Using glue sticks or flimsy tape to seal your package may result in it opening up and the contents falling out in the back of a crowded mail truck. Instead, you should only use high-quality packing tape to seal it. The best way to ship expensive jewelry (or anything of value for that matter) is to make sure nobody can tell what you’re shipping. Your package will pass through many hands and may even be left on someone’s doorstep. If you run a jewelry business and put anything referring to jewelry on the front of your package, you’re risking that someone will steal it. Not only will this be costly, but it can hurt your business as your customer may think you failed to send the package. Instead, make sure your packing is not obvious. Use a plan package and a return address that doesn’t make the contents of the package obvious. For example, if the name of your company incorporates worlds like “jewelry,” “gold,” “diamonds,” or “luxurious”, it’s best to leave it out of the return address. Instead, only put the companies address on the front of the package and a business card inside the package that includes the company name. The courier you choose can go a long way when shipping jewelry. The safest way to ship valuables is by using an experienced and trusted courier. The right courier will ensure that your packages arrive quickly and safely. When looking for a courier, opt for one with various options, including one-day delivery and package tracking. Tracking your packing can be a great safety net. You’ll be able to see where your package is and when it arrived there. If there is a problem, you’ll be able to call the carrier and say that it arrived XYZ location a few days ago, but never left. Not only can this help track down your missing package, but it’ll help you stay ahead of the game. Without tracking your packages, you may hear from your customer that their order from last month never arrived. At this point, it’s been so long that the package could be gone forever! Instead, you’ll be able to inquire about its location the second you suspect something may have gone wrong. If something does go wrong and your jewelry is lost, stolen, or damaged in the shipping process, then you could be out a lot of money. Just one lost or broken necklace could set you back a couple hundred dollars. Imagine what would happen if a package containing several expensive pieces of jewelry was lost. Instead, take a proactive approach and insure your package. You’ll feel more confident knowing that you have a safety net in case something goes wrong. Another way to ensure your package arrives safely is to request a signature upon delivery. Many packages that are left on front porches get stolen by neighbors or people passing by. Requesting a delivery signature helps make sure that your package goes straight from the courier to the recipient. If they aren’t home, the package will stay safe and sound at the post office until they can receive it. Shipping jewelry and other valuables can be a stressful process. Whether you’re shipping your own personal belongings or you run a business that needs to deliver valuables to customers, you may worry that your package will get lost or damaged before it reaches its destination. 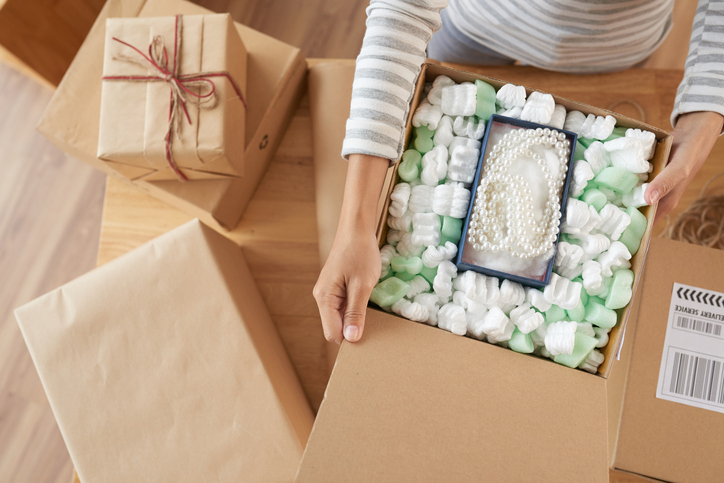 Luckily, there are several tips for shipping jewelry to help ensure this doesn’t happen. Packing it tightly with the right materials and using plain packaging can help minimize risks. Also, make sure you choose the right courier and track your package. Did you enjoy what you read? Check out our blog for more helpful shipping articles like this. Considering that half of all businesses lose money on shipping, the place where they stand to lose the most is on rushed shipments. Whether you are a wholesaler shipping out to clients around the world or an office that makes specialty products, you’ll surely encounter issues with deadlines. Even if you have the best scheduling routine on the planet, urgent shipments come up. When you realize it’s time to make urgent shipments, your next worry will probably be about cost. An inexpensive courier company might offer a great deal but you’ll also have to ensure that they can reliably deliver on your customers’ deadline. You need to organize your thoughts and your workflow when you’ve got urgent shipments to make. Follow these 5 steps to ensure that your next rush orders arrive without the slightest hiccup. Before you get hit with a bunch of rush orders, you need to take a sober look at your shipping workflow. Every step of your ordering, picking, packing, and shipping process could probably use room for improvement. See which steps could be helped by automation and which might be hurt by it. Measure efficiency not only in how many orders go out the door but also by how many orders are processed incorrectly. A slower process might be what works for you or it could disrupt your staff. If you’re paying big money for rush shipping but also spending money to replace inaccurate orders, balance your sheets to see where you could make adjustments. Ultimately, you want to make life easier for your team so that you can fulfill orders efficiently without mistakes. 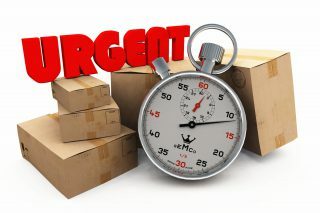 Urgent shipments that are also inaccurate will cost more than a shipment that arrives a day late with everything your customers expect to receive. If you’re inundated with 10 big shipments that need to go out 10 minutes ago, you need a way to measure which one gets top priority. A quick assessment of each customer’s profit potential, your history with them, and how much you’ve spent on that lead is very important. While you might think you should prioritize a large order by a new customer than a small order from another customer, think again. A small order from a customer that cost you thousands to close with needs to be treated seriously. At the very least, you need to recoup the expenses you paid for getting that client. There should also be products and promotions that take precedence over others. If you’ve just given a deep discount to 20 customers who need urgent shipments and a few that paid full price, put your full price customers first. When you get a big discount on an item, you’re more likely to chalk up a slower shipment as the price you pay for a great deal. Before you send out a bunch of heavy orders in a rush, take a look at the schedule of fees your delivery company charges. You might need to talk to someone from the accounting department to make sense of it, but it’s important to dissect everything. 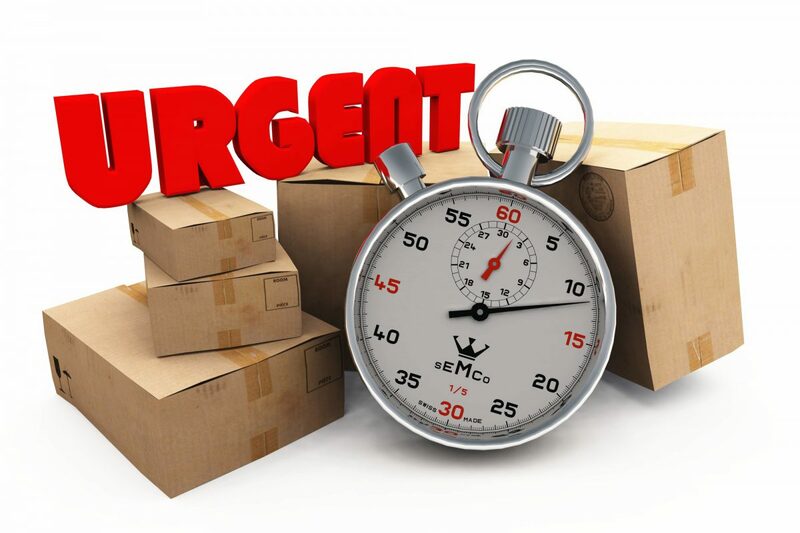 You don’t want your shipper to be sneaking in some extra charges with your urgent shipments. If you have a tight budget, this can be a killer for your company. Make sure you also keep good records to compare. You need to go with a shipping company that is clear about extra charges. Failing to account for them can destroy your bottom line. Get your shipping provider on the phone to see what they can offer and have them go through each fee line by line. Working with a great courier means that you’ll know exactly what you’re getting with each itemized fee. While this might be a no-brainer, the way that you pack your shipments can have a big effect on cost for your company. If you’re using expensive packing materials, see where you could be cutting corners. If you have a standard size of your products, you could get boxes that fit your products tightly, requiring fewer packing materials from you. If you’re using expensive packing peanuts or cushion materials, look into alternatives. Don’t risk your products to save money, however. This will come back to bite you for sure. Poorly packed shipments will result in damaged items and returns. You could end up losing thousands of dollars from returns per month, much more than an extra hundred in packing materials would cost. Run some tests so you know how much you can get away with. Are you charging your customers enough for shipping? Shipping prices can be a huge turnoff for customers. Including shipping in the price of your product could be the way to offer free shipping and attract customers. When it comes to urgent shipments, you can’t always include shipping or you might take a huge bite out of your profit margin. However, if you’ve already lowered standard shipping fees to zero, the difference in price might be acceptable to your clients. Run a few promotions to see what kind of effect free standard shipping has on your sales. You might be surprised at how much of an edge free shipping can give you, even if the price of your products goes up. If you come through for your customers at the 11th hour, you’ll build serious brand loyalty from them. Customers who feel like they can rely on you even when they’re under stress will stick with your company through thick and thin. Offer a steady stream or promotions and discounts and you could see big returns. If you’re looking for other ways to build your customer base with a strong shipping program, contact us today. Don’t have time to wait three to five business days for your package to be delivered? Don’t even have time for rush two-day shipping? Chances are you’re in need of on-demand delivery. On-demand delivery is exactly what it sounds like. With the ability to order and receive your package in just a few hours notice, this speed of delivery enables both businesses and individuals to get the items they need exactly when they need it. Wondering why you should try on-demand delivery? Below, we’ve included seven reasons to have your package delivered whenever you demand it. Read on to learn more and try it out for yourself. If you’ve just shelled out major cash for an important, fragile, or rare purchase, you don’t want to run the risk of the item being mishandled by typical delivery services or even lost in the mail altogether. Instead, on-demand delivery takes away the anxiety and provides you with greater peace of mind. When you know your item is in the capable hands of an experienced delivery person and is making its way to you at that very moment, you can trust that the item will be delivered in great condition and on time. 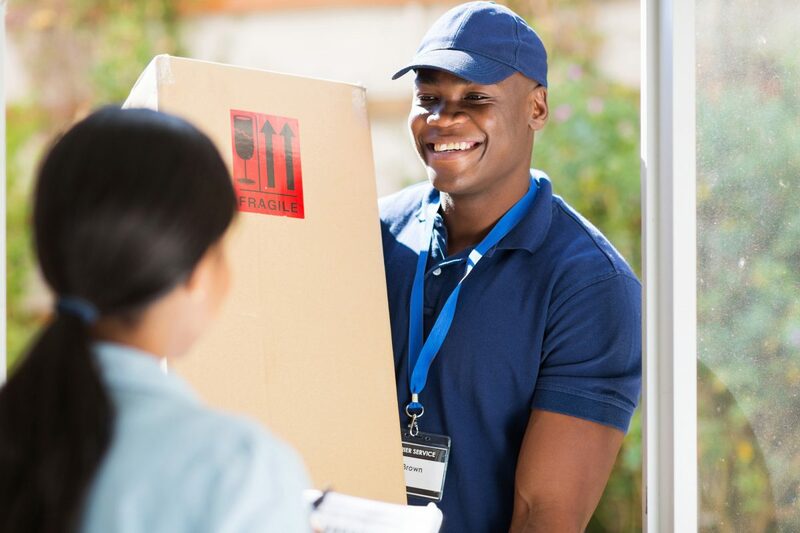 When your item is the sole responsibility of a delivery person assigned to the task, you can trust that it will make its way to you with absolutely no hassle at all. Life happens, and unforeseen circumstances arise. What happens on your wedding day if you realize you completely forgot to buy a pair of shoes? Or what happens if your paper business completely runs out of ink? When purchasing from retailers across town or across the world, sometimes it’s just not possible to run to the store and get the item you need. You may not have time, or they may not carry the specific brand of item you need. When you encounter last-minute delivery needs, this is where on-demand delivery service comes in. One of the best ways to reach the market around you is to offer on-demand delivery options to local customers. Maybe you’re a florist who is happy to beat out the big names for customers located in your surrounding area. Or maybe you simply want more exposure in the region your business is located. Whatever the case, having on-demand delivery as part of the equation can be a game changer — both for your business and for your customers. Have you run into a major hang-up at home or at the office? Ordering from that big-name corporation may solve your issue…but it won’t solve it today. Instead, try an on-demand service. Let’s say your microwave oven goes out on the same day you’re having friends over for appetizers you need to cook in said oven. Don’t let the party be ruined — just have another replacement oven delivered on demand. You won’t even have to leave your house to go shop for one. It’s like having a magic genie wave their wand and all your headaches are gone. Why wait days to have your problem solved? Get the items you need when you need them, and receive same-day resolutions to the problems you encounter. Need that unique item, and need it today? On-demand buying makes it possible. In today’s world of online shopping and instant gratification, people want to make impulse purchases and then be able to use or hold it that very same day. Delivery on demand gives you this ability. You can make an impulse buy and then not have to wait days and days to be able to enjoy it. With an on-demand service, you really can have your cake and eat it that very same day. Want to make your customers really impressed and overjoyed with your business? A perk like on-demand delivery is the way to go. Can you imagine how you’d feel if you ordered something online and it showed up at your door in a matter of hours? That “wow” factor is the same thing you want your customers to experience. Offering an unusual delivery speed like this places you above the competition and presents you as a trendsetter in your industry. Why would your customers order from the competition if they know you’ll be knocking at their door the same day they order something from you? Let’s say you’re trying out a new kind of ingredient for your restaurant. You order from a supplier and the spice or tool takes up to five business days to arrive. It doesn’t work out for you, so it’s on to the next one to try. You go through this process again and again, and before you know it, you’ve spent weeks or even months in a trial and error phase, trying to find the right fit. This exact process could apply to any business or consumer. That’s no way to do business! Having so much time between ordering an item and having it in your possession is a rapid way to drive your productivity levels in the ground. If you’re always waiting for the item you need in order to do your job, you will never be able to put in the daily grind and get the results you want. Delivery on-demand takes away this hassle and puts your productivity back into your hands with minimal downtime and the ability to make rapid decisions for your home or business. Not having to worry about how your items will get to you and when they’ll get to you allows you to focus on what matters. If you’re ready to try on-demand delivery for yourself or for your business, we are here to help. We’re available to answer any questions you may have and assist you in figuring out the logistics of on-demand delivery. If you need a rush courier and need it now, browse our site to get a quote. Our fast walkers and delivery vans are standing at the ready! Many companies are starting to talk about white glove delivery. However, few people really understand what this new type of delivery actually involves. Nowadays many people expect high-standard customer service and timely delivery of goods. But delivery services that claim offer white glove services are about going that extra mile to offer customers an exceptional delivery experience. Do you want to find out more about white glove delivery? Keep reading to learn more about the best quality delivery service out there. Many people are confused about what why this high-quality service is called white glove. But the term is very useful to understanding what’s involved in the service. According to online dictionaries, white glove refers to “meticulous” and “spotless”. But white glove services are not just about putting on a pair of white gloves to deliver you the items you ordered. But people wear white gloves when taking extra care handling delicate and valuable items. You may have seen this in movies when it comes to reading antique books or handling evidence at a crime scene. This is a useful way to think about white glove delivery as well. This is because white glove services involves carrying out the delivery process with extra special care. A good way to understand white glove services is providing a delivery service that exceeds normal expectations. This requires professional delivery services that add value to what they offer to make sure the recipient receives the greatest customer service. Any recipient should always know that they have received a special service. If they don’t notice the difference between a white glove and normal delivery service, something isn’t right. Delivery services also provide customers with the opportunity to track the progress of the delivery. You can usually view the progress of your goods at every stage of the process with online tracking tools. At every stage of the delivery process, the customer should experience absolutely no stress. This means everything from ordering the goods to receiving the goods at the chosen location. This should be a basic requirement of any delivery service. However, this is even more important when it comes to white glove. If the delivery service keeps the customer waiting or disrupts the day, this isn’t meeting the high expectations of the service. White glove services don’t stop when the goods are dropped off outside the residence of the customer. In many cases, white glove delivery requires staff to place the item wherever the customer requests. This probably also involves setting up the product for customer’s use, such as a television or an item of furniture. The customer shouldn’t be left with the problem of disposing off any excess packaging from the delivery of the goods. Instead, this should always be taken away by the delivery service. This should then be disposed of appropriately. If a customer is not satisfied with the goods they have received, white glove services offer customers the chance to return the goods. This could be in exchange for another item, or full compensation. It’s important to inquire whether this is possible before you purchase any items. No white glove service is complete with the opportunity for feedback. If a customer has any concerns or complaints, they can help to improve the overall service. Customer feedback allows the delivery service to immediately rectify any problems the customer has experienced. Which Items Need White Glove Delivery? Now that we’ve established the expectations that come with white glove delivery, we have to go through which items should be delivered white glove style. Professional standards should be adhered to regardless of the size or fragility of the package. But some goods require greater care in the delivery process than others. For instance, the delivery of a package of clothes requires no extra attention. Whereas, when delivering valuable and fragile jewelry white glove services may be essential. It may not be because of the fragility of a particular package, but instead of the sheer size of the item. 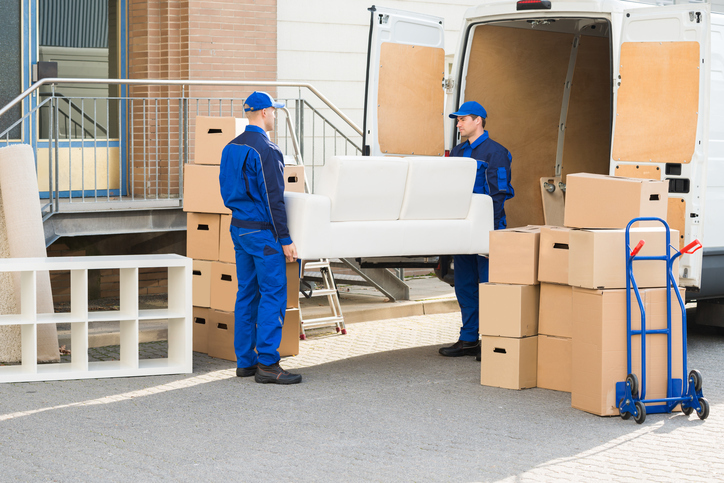 Unless the customer has a vehicle to transport large items, such as furniture, they may require white glove standard delivery. The item also determines which type of transport is required. For example, if the item needs to be delivered through narrow roads then this needs to be considered when selecting the transport. White glove services involve providing the best possible service for every customer. This means that delivery staff, such as drivers, need to be trained in white glove professional standards. Customers should trust the delivery services as though they were handling the delivery themselves. Of course, without any of the stress for the customer. White glove delivery should also be affordable for the customer. A customer-oriented approach requires prices to set at a competitive and affordable rate. Are you looking for the best quality service to deliver your items? With white glove delivery services, you can be sure your items are delivered on time with excellent customer service too. Get a quote today to find out more about how much it will cost for your item to be delivered with white glove delivery. Have you ever had a time when you needed to have something delivered immediately? Like a document or maybe even a product you sell? When you sell products to local clients, it makes sense to have a means to deliver it to them right away. After all, they’re in the same city or state, so why should they have to wait days to get it in the mail? Imagine the brownie points you can earn by delivering a product to the doorstep of a customer the very same day. This would take your brand to a whole other level – up an beyond your competitors. But since you may lack the finances to hire your own in-house team delivery crew, there’s one other option. You can work with a same day courier service. If you’ve never considered hiring one, then here are the top 10 reasons why you should. This is our first point because it’s probably the most important. Making life easier for your customers should always remain a top priority. So to make ordering products from your company more convenient, you can offer same day shipping. And what better way to pull this off than with a same day courier service? This beats two-day shipping and even overnight shipping. Within hours, your customers can have their new product in-hand without leaving the comfort of their home or office. By hiring a same day courier service, you can reduce the costs of operating your business vehicles. And since they’re not driven as often, the costs for fuel, repairs and maintenance are also low. As a business owner, you shouldn’t have to fret about having something delivered within hours. If you don’t already have your own in-house delivery team, you can resort to same day courier services. This way, your customers can get the product the same day versus waiting overnight or a couple of days to receive it. Now, your focus can stay on the core functions of running your business. Cutting costs is inevitable in the world of business. It’s important to find areas of your company where you can minimize overhead, so you can spend more in areas that are more profitable. If you currently have an in-house delivery team, then you are wasting a ton of money when you don’t have to. For instance, you have to pay payroll taxes, overtime pay, employee benefits, paid time off and sick leave, as well as worker’s compensation. You can avoid these expenses when you outsource to a courier service. Also, you can eliminate or significantly reduce your fleet, if their sole purpose is to make deliveries. What happens if one of your in-house delivery drivers gets into an accident? And worse, is at fault? The liability falls back on your company and its insurance provider. This is a real headache to deal with and can significantly hurt your company financially. So to avoid this, you can get rid of your in-house drivers and focus on using courier services. By doing this, you can relay the liability and risks to the courier service provider. Consistently training your personnel is key to ensuring quality and customer satisfaction. This means you have to continue training and certifying your in-house drivers to provide high-quality delivery services. Training and certificates aren’t free and require you to pay out of your company’s pocket. Again, you can avoid this when you outsource to couriers. They handle all the training and re-certifying instead. You can’t expect your in-house delivery drivers to transport packages for you at 3 am on a Sunday. However, some same day couriers will do just that. They operate 24 hours a day, 7 days a week. And they’ll pick up and drop off your goods no matter if it’s the weekend, a holiday or late in the evening. This can be very useful when you have emergency packages that require immediate delivery. For instance, a legal document that can’t be faxed. Or a medication for a sickly patient. Some couriers offer more than just your typical delivery services. For instance, they may also provide last flight out services to ensure your package arrives in the nick of time. And some offer legal process serving for court documents. White glove delivery services can also be obtained from certain same day couriers. Surely, you can find great use in these type of services, especially if you work in the legal or medical field. However, other businesses may benefit from these as well. Customer loyalty is the goal of every business. And what better way to achieve this than with same day delivery of a much-needed product? For example, you’re a retail store or boutique with a fashion designer customers, requiring a specific garment right away. Delivering this right to their doorstep within minutes or hours can really boost your credibility and their loyalty. It’s a great way to boost your sales and customer satisfaction. Since you don’t have to pay for an in-house team, you only have to worry about paying when you absolutely need same day courier services. This is beneficial to your bottom line, as well as appeasing customers. Once you find a reliable courier service, you can put your mind at ease that your goods will always arrive quickly and safely. As a business, your goal is to ensure customer satisfaction. And that’s exactly what we take pride in at ASAP Courier. We offer white glove deliveries to all of our clients to ensure their goods are handled with care. It doesn’t matter whether you need a document or couch delivered, we’ve got you covered. We offer services that include pre-scheduled routed deliveries, rush courier & on demand, warehousing, air freight, refrigerated services and last mile home delivery. If you’d like to learn more about our service, feel free to contact us today for a free estimate!